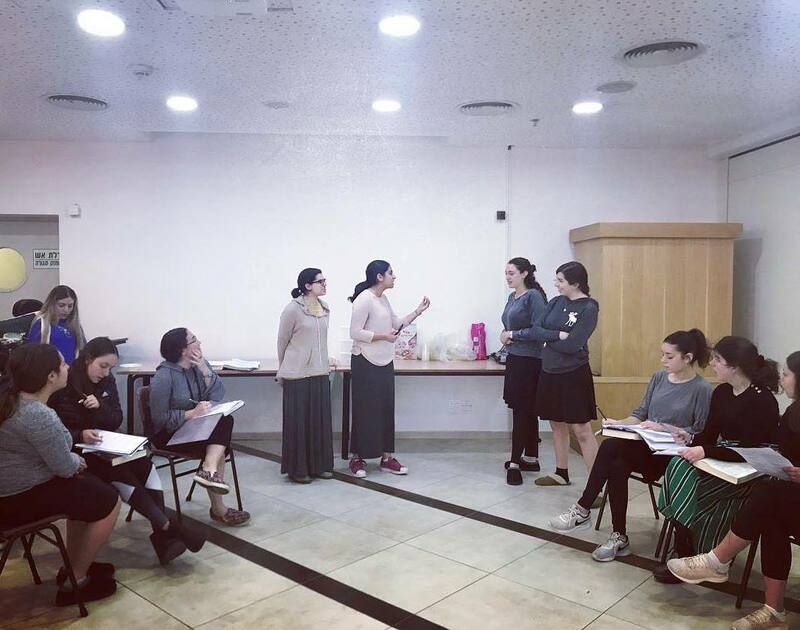 For the last four months, students in Midreshet Lindenbaum’s Maria and Joel Finkle Overseas Program have been learning in-depth the 8th perek (chapter) of Tractate Bava Kama, which deals primarily with a person’s responsibilities if he injures another individual. Instead of the traditional chazara (review) of the material, they created their own Midreshet Lindenbaum Mock Beit Din (accompanied by a delicious pancake breakfast ). Students were divided into three groups, with each assigned a specific sugya (section of the Talmud). The litigants in each group were given the task of creating a modern-day case that utilizes the principles discussed in their sugya. After the dayanim (judges) on the beit din interrogated the litigants and ascertained all relevant details, they consulted and handed down their psak din (halakha-based ruling) in the case. The students came up with innovative ideas, employing a case in which one person ice skated over another’s fingers in order to explore the limits of the beit din‘s authority in the absence of real semicha; of a boy forwarding inappropriate pictures of a female friend to apply their sugya‘s laws of boshet (humiliation); and of a person with a broken leg experimenting with unconventional, risky remedies in order to test the halakhic limits of the assailant’s responsibility to pay for the victim’s medical bills. All in all, the morning was filled with thought-provoking, engaging, and creative applications of the Talmudic sections which helped the students appreciate how much they’d learned. PrevPreviousParshat Terumah: What’s the Story?